Children’s/Young Adult Books For Christmas! One of the nicest things about getting involved in the book world from the point of view of an emerging writer is that you get to hear about and read some really great new books, sometimes even before they’re published. Here are some of my recommendations for books to buy for children and young adults this Christmas. I’ve linked to Amazon just because it’s good for seeing reviews but another lovely thing you can do at Christmas is to support your local independent book store, so here’s a link to No Alibis in Belfast too, because they’re so great, and they do have a lovely wee children’s section which you should go in and browse any time you’re in Belfast. You’ll find local books there that you won’t find anywhere else. First up is the first two books in Ruth Fitzgerald’s ‘Emily Sparkes’ series. Ruth’s writing is hilarious. My ten year old daughter loved these books and I’d imagine most 7-11yr olds who enjoy a good laugh will as well. They do deal with serious issues too (the arrival of a new baby in the house/ friendship issues/ bullying), and in my view the balance between these issues and the humour is absolutely spot on. I personally like them more than the Wimpy Kid series (which my girl also loved) because they have a little more grit but no less humour. 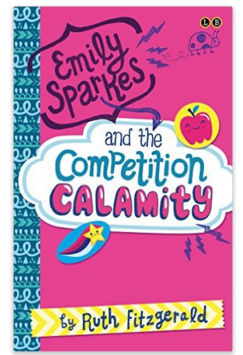 There are more in the series to come which is a good thing because Emily Sparkes is so readable that kids who enjoy reading will fly through them really quickly. 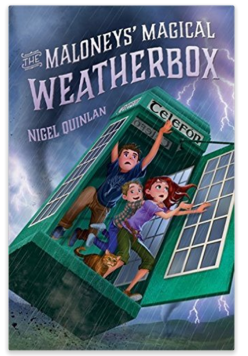 The next book I want to mention is The Maloneys’ Magical Weatherbox by Nigel Quinlan. I was lucky enough to attend the Children’s Books Ireland conference this year in Dublin and Nigel was one of a number of Irish writers who had been invited to speak about their new books which came out this year. I loved the idea behind this book- a telephone box which changes the weather- and I liked that it was set in Ireland. When I heard Nigel read a section from the story I knew it was going to be great. Again, very funny and really nicely written. It reminded me a wee bit of Frank Cottrell Boyce’s Chitty Chitty Bang Bang Flies Again- funny and charming and a treat for adults to read to their younger children. Sheena Wilkinson’s Name Upon Name is a great wee story about a mix ed-religion family in Belfast set in 1916 during World War II and the Easter Rising. A brilliant one for helping young people (and adults!) understand some of the issues around these historical events, but also just a great read. A good read to prepare for the Easter Rising centenary next year. Lastly I’ll mention a book for young adults: Nothing by Janne Teller. This was my personal favourite read of the year. It didn’t come out this year but I read it a couple of months ago and it blew me away. I had to mention it because it is different to any book I’ve ever read. If you have a young adult reader who likes to think about deep and difficult issues around religion, philosophy, meaning-of-life type stuff…. this is the one. It is the story of what happens to a group of friends when a single idea becomes more important to them than anything else. 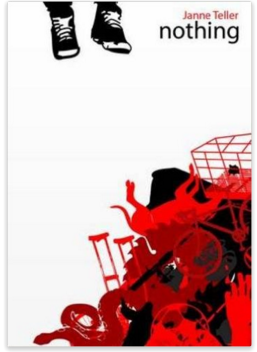 Highly disturbing, really clever, and just one of the best books I’ve ever read. Not in the slightest bit Christmassy. I would have completely loved this at age fifteen. A good one for adults too. Those of you who liked what we did at Ikon will find it interesting. That’s all I have time to write! I have left out so many but here’s what I’ll do: if you want to write a blog post about your three or four book recommendations for Christmas then write it and send me the link and I’ll collate them all here in a new post and we’ll all have millions of things to read and give over the holidays! Hooray! P.S. I should probably give a shout out to my own book. I am terrible at this self-publicity lark. Anyway- it is my self published book, Widows’ Row, and it’s still selling and I’m still getting some lovely feedback about it. Good for young adults and old adults :-), set in Northern Ireland, themes around religion/atheism, homophobia, and it’s a bit ghostly. Enjoy!